Don’t let your air conditioner’s foul odor ruin your day! You expect to smell exhaust fumes from your car, not from your air conditioner! The engine in your air conditioner, as well as a few other components, contain fluids that can sometimes leak out, which leads to the exhaust fume smell. If you smell exhaust fumes coming from your air conditioner, get a professional to address the problem right away, because leaking components could be dangerous. If your air conditioner smells like gunpowder, it could be a sign that either the fan motor or the circuit board in your system has shorted out. 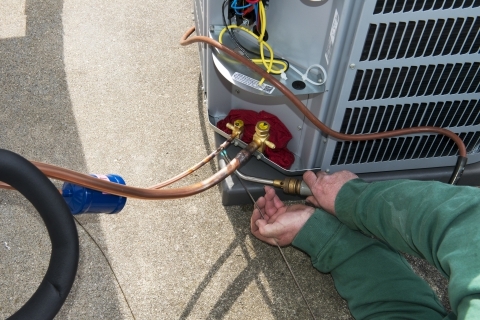 Typically, this odor will be most noticeable when you initially start up your air conditioner. Have a professional take a look to figure out which parts need to be repaired or replaced. Does your air conditioner give off a funky odor? Don’t just live with it, call in the premier air conditioning experts in Denver from Premier Heating and Air! We offer competitive rates, prompt service and free estimates. Contact us today!